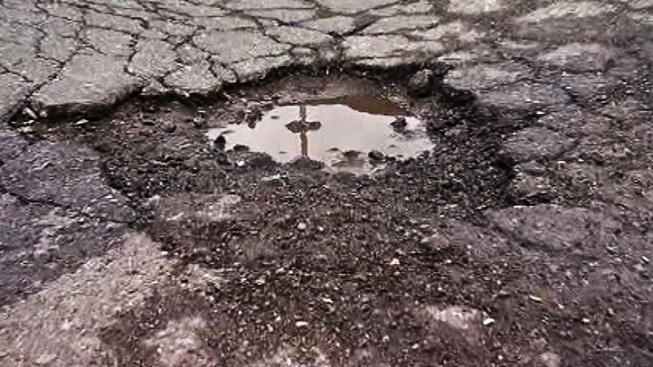 The wet winter weather is wreaking havoc on our roads, and potholes seem to be popping up everywhere. If you're not careful, it could end up costing you. "We have had well below freezing temperatures on pavement,” said Lamont Hinton, of the D.C. Department of Transportation. “We have had a lot of rain. That moisture begins to deteriorate some of the roadway surfaces, causing the potholes." Chevy Chase resident Randy Denchfield says he’s used to seeing hubcaps near his fence close to Connecticut Avenue, but he’s not sure he’s seen this many in previous winters, and he believes the rough roads are to blame. “Come by next week and we'll see,” he said. “We might have the whole fence covered with hubcaps." Local body shops say the price to fix a bent rim from a pothole can range from $175 to $250 per rim. In Montgomery and Prince George's counties, the Maryland State Highway Administration spends about $500,000 patching potholes every year. While the State Highway Administration says it's fixing the potholes on weekdays during off-peak hours, they also want to hear from you about new ones. Drivers can go online and report places where you see a pothole. The Virginia Department of Transportation said it is in full pothole patching mode now as well. Potholes on state-maintained roads in Virginia can be reported to VDOT by phone at 1-800-FOR-ROAD (1-800-367-7623). Potholes within cities and counties should be reported to that area's public works department. D.C. residents can call 311 to request pothole repairs or they can complete a service request online.